So it's Father's Day and you still don't have any gift for him... there's no more time to go around your local malls and think of what to give him or order online, what do you do?? Panic mode starts and you don't know what to do. Don't worry since I will be sharing with you something your dad will really love and appreciate. It is simple..Just create something for him using an old mug (but make sure it's clean and still looks good), some enamor paint, a paint brush or you may your your hands and just a little of your creativity. I know this sounds childish and yes it may be a little but this will something that your dad or husband will remember every morning while drinking his coffee. You may work on it alone or ask your kids (if you're a mom) to help you with it. 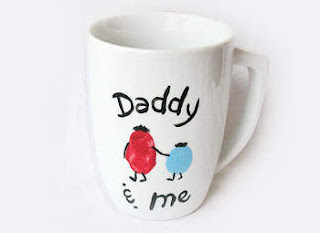 Click here for the complete instructions on how you can create your own coffee mug for your dad.